Purpose: In many places, especially in emergency department, central venous catheter is still inserted using anatomical landmark guidance with a success rate up to 97.6% and complications up to 15%. 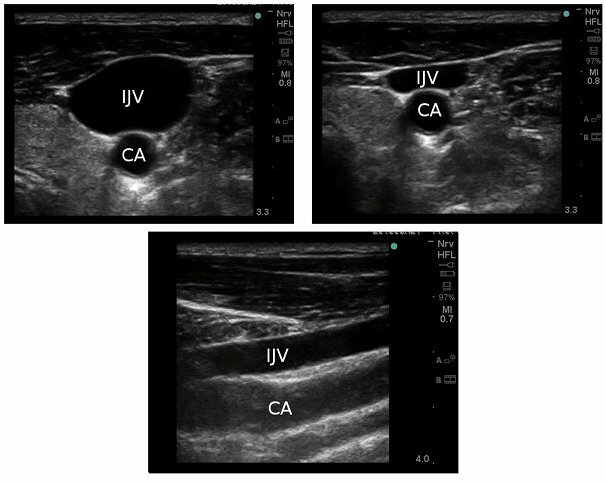 This study was aimed to determine by the support of ultrasono-graphy (US) the anatomical variations of the internal jugular vein (IJV) in relation with other structures of the neck, such as the common carotid artery (CCA). Material and Methods: 830 patients requiring central vein catheterization (CVC) were in-cluded in the analysis. 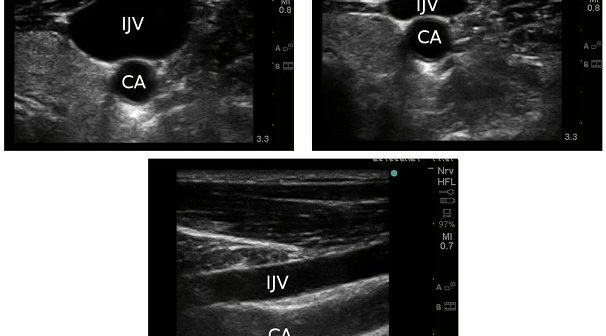 The position of the IJV in relation to the other structures of the neck was demonstrated by portable ultrasonography. Results: The mean diameter of IJV was 10.3 mm in right and 10.5 mm in left side of neck, in male (p > 0.05) and 9.1 mm in right and 10.5 mm in left side of neck, in female (p > 0.05). The mean distance between IJV and CCA was 1.9 mm in right and 1.7 mm in left side of neck in male, and 2.0 mm in right and 2.2 mm in left side of neck in female. The mean distance of IJV from the skin surface was 9.8 mm in right and 10.0 mm in left side of neck in male, and 12.1 mm in right and 12.5 mm in left side of neck in female. On 25.54 % we observed variations of internal jugular vein site. On 3.97 % we observed a small caliber of internal jugular vein that could complicate the catheterization of the vein. On 1.8 % was diagnosed a thrombus of internal jugular vein, that is considered as an ab-solute contraindication for a CVC. Conclusion: Different patients had anatomical variations that are important and should be knowed, in order to reduce the possibility of severe complications.